"New for 2016 from Proto Paintball is the Proto Maxxed Rize gun. The Proto Maxxed Rize is a Proto Rize with all the good upgrades already from the manufacturer. These upgrades include a Dye Lever Lock Low Rise Clamping Feed neck to secure your hopper in place, a Proto True Bore precision two-piece 14” barrel, and an On/Off Airport ASA. There isn’t much to upgrade performance wise on the already stout Proto Rize marker so these upgrades are mainly for convenience, but they make a noticeable difference. 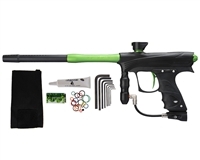 Taking over where the Proto Rail left off, the Proto Maxxed Rize paintball gun hits the market at a low price point of just $324.95. 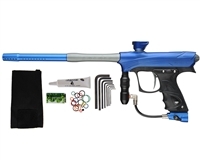 A paintball gun with this many features usually can’t be found for less than $500, but the innovative design team at Proto managed to make that happen through the use of some composite parts that don’t hinder performance or durability. A two-piece 14” precision barrel coupled with the consistency of a Dye Hyper 3 Inline Regulator shooting at 140psi make the Proto Maxxed Rize one of the smoothest shooting spool valve paintball guns on the market. A large focus on this new marker can be seen in reliability. A brand new and improved solenoid is stronger than ever before and the Proto Maxxed Rize also features a self-cleaning Eye Pipe with integrated ball detents. Nothing is more frustrating than going to the field and having something go wrong with your paintball gun. With these new features on the Proto Maxxed Rize, you should be good to play as hard as you want all day with no worries! A newly designed 3D contoured body gives the Maxxed Rize an aggressive but clean look. First production runs include 3 two-tone color options. Available now at ActionVillage!"